Krispy Kreme is celebrating their 76th birthday and wants to share it with you! 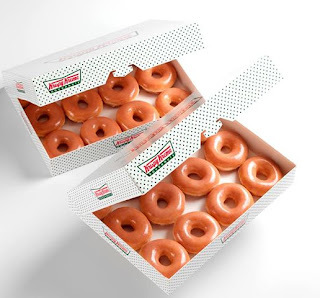 Tomorrow, July 13, Krispy Kreme is offering a dozen of its signature Original Glazed doughnuts for only 76 cents with the purchase of an Original Glazed dozen at regular price. No coupon required. What type of Krispy Kreme doughnut is your favorite? are you trying to crash my diet?! I just love love love Krispy Kreams...thank goodness they are not available close to home. I have to drive about 20 miles for the nearest store -- but they are worth it! Ughh I missed it! Krispy Kreme doughnuts are so good! I wish we had a store around her that sold them. The closest to me is in Ogden Utah and it's quite a drive. More like an overnight stay :) Might have been worth it though!